I have been honoured to help create families for my clients from across Australia and 30 countries overseas. 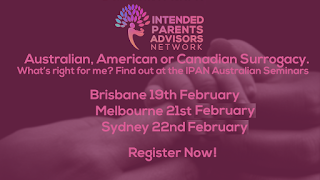 I'm proudly taking part in the Independent Parents Advisory Network seminar in Sydney on 23 February. The seminar involves reputable clinics and lawyers talking about surrogacy options in the US, Canada and Australia. Join us at the upcoming IPAN seminars in Brisbane, Melbourne and Sydney to learn about Surrogacy, Egg Donation and IVF options in Canada, USA and Australia. If you are considering starting a family and need some help doing so, these events are for you. Whether you are gay or straight, married, partnered or single, there will be options presented that are available to all. At each event you will hear the latest information from Lawyers and Surrogacy Professionals. The seminar is part of a series in Brisbane, Melbourne and Sydney. If you are interested in the seminars, click here. People who live in NSW must take extreme care in undertaking surrogacy overseas so that they do not commit offences in NSW with egg donation or surrogacy. The offences may still apply even if the egg donation or surrogacy occurred overseas. Anyone living in NSW contemplating egg donation or surrogacy overseas should get expert Australian legal advice first. "Thank you so much to EVERYONE who has helped us up until this point & everyone that will come into our lives to help us in the future. Stephen Page of Harrington Family Lawyers, without you standing up for what's right, we would not be talking about this today. With all the love in THE WORLD!" "Can you please pass on to Stephen how immensely heartened and relieved I felt after speaking to him? I think until after the appointment I didn't realise how much had dark and confusing for several months, and he helped me to see that with patience and flexibility we can work our way through this surrogacy thing, and most likely come away with a baby, which is what we want so deeply. I had been feeling this was really a long shot, but feel much more hopeful, in a realistic way, that we can get through this if we just take it one step at a time." "Thank you. Dear Stephen and Associates, A big thank you to all for the hard work, that went into, making my long time dream of being a mum, come true. A big thank you once again...."